This delicious treat includes whole grain and two of your five-a-day. Preheat the oven to 180°C, gas mark 4. Grease 4 x 200ml ramekins. Whisk together the eggs, vanilla, soft cheese, yogurt and honey. Stir in 100g raspberries. Dry fry all the oats in a pan then reserve the 2 tbsp. Mix together the remaining 75g oats and low-fat spread and press into the base of the ramekins. Pour the cheese mixture on top. Bake for 40 minutes until golden and firm to touch. Allow to cool before removing from the ramekins. Meanwhile, slowly cook the remaining 300g raspberries in a pan with 3 tbsp water for 5 minutes, then purée for a smooth coulis. This can be done in a blender or with a hand blender. 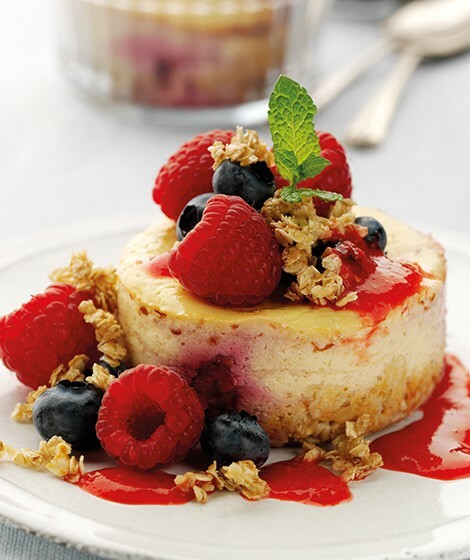 Serve the coulis with the cheesecakes sprinkled with the reserved toasted oats and fresh berries (e.g. blueberries or strawberries). Add a little cinnamon to the oats for extra spice or replace the raspberries with blueberries. "Glad you liked it! Thanks for letting us know"